If the above quote holds true then we should see, e.g., higher PPP of an attacking unit that's down 10, compared to when the game is tied (assuming all players are average). To try to quantify how large the effect is I put in additional binary variables into my RAPM framework, one variable for being up a certain amount of points before each possession started. Those variables run from 'down 57' to 'up 57'. Have you considered using this as another RAPM variable (if it's linear)? That would go a long way in helping adjust player values for garbage time. Awesome - this was my guess for the adjustment that Wayne Winston thought only he and Jeff Sagarin were taking into account a few years ago. Will 2013-14 RAPM on stats-for-the-nba.appspot.com be updated to include this effect? This is very cool. For a while, we've just been treating all possessions the same, so it's good to see this work done. I've always wondered about garbage time possessions. I know I've seen an old model adjusted with a "leverage index," which I think gives possessions during close games with little time remaining heavy weight and maybe the playoffs too. By the way, do you use a variable or adjustment for having no rest (i.e. a game the day before for the home/away team)? Is this on a unit by unit basis or just with all teams together? The steepness of the fit of the data might be an interesting characteristic of each team, pairing, or unit. AcrossTheCourt wrote: By the way, do you use a variable or adjustment for having no rest (i.e. a game the day before for the home/away team)? Very interesting. Does anybody know if anyone has taken a more direct look at this? 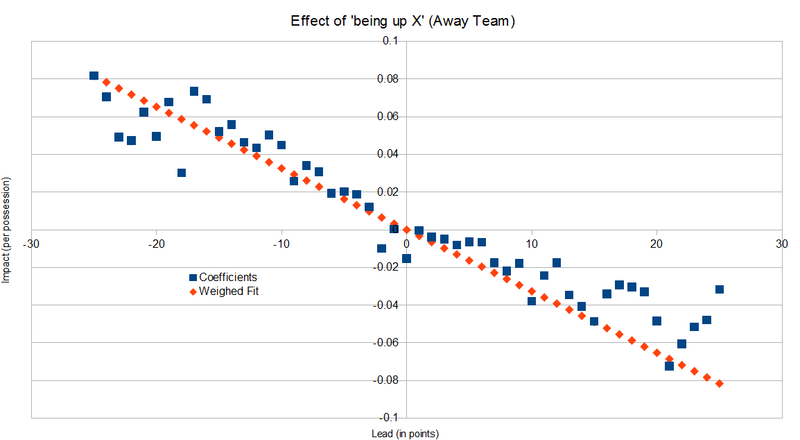 Meaning just looking at actual possession outcomes, after stratifying by scoring margin? I suppose there's some selection bias that could sneak in there though (bad teams tend to trail more often than not). Does RAPM take into account garbage time? What about intentional fouls. J.E., how did you take into account intentional fouls? Did players get credit for them. It seems like it would make sense to ignore intentional fouls and the last minute of garbage time because some teams aren't playing hard defense. bbstats wrote: Have you considered using this as another RAPM variable (if it's linear)? That would go a long way in helping adjust player values for garbage time. mzappitello wrote: Is this on a unit by unit basis or just with all teams together? They would cancel out at the player level for the most part, over the course of the season (providing a balanced schedule in that regard)... but you would be able to calculate the exact values for that variable, because you have matchups on a game by game level. 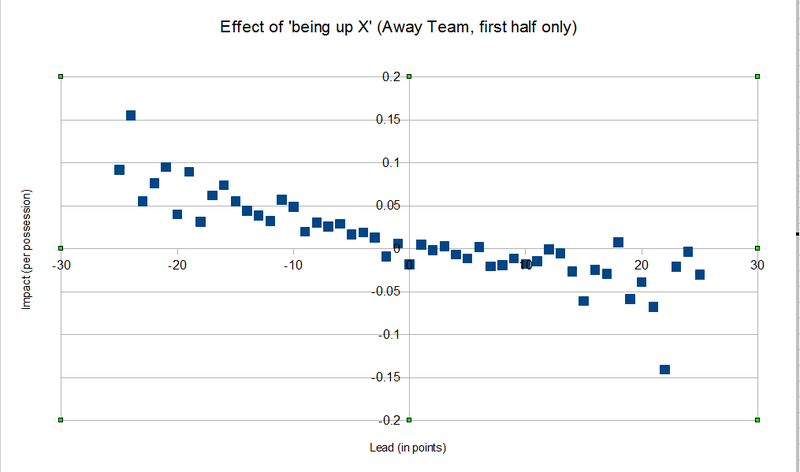 Simplest explanation is the team that's down is more likely to try and score quickly whereas the team that's leading will try and milk the clock. And while I think the causation is slightly messy, the observed results would mesh with Knarsu's observations about shot quality decreasing as the shot clock runs. sethypooh21 wrote: Simplest explanation is the team that's down is more likely to try and score quickly whereas the team that's leading will try and milk the clock. And while I think the causation is slightly messy, the observed results would mesh with Knarsu's observations about shot quality decreasing as the shot clock runs. That's my first guess as well, coupled with some regression to the mean. JE, could you run the same analysis but only looking at the first half of games? If the effect shrinks a decent amount, it would fit with the idea of leading teams simply running the clock. xkonk wrote: JE, could you run the same analysis but only looking at the first half of games? Some of the patterns in the data look extremely similar - the bounces from -2 to 1, the dip at 10, etc. I can see the values aren't exactly the same, but is this maybe more similar than we should expect? I know that's a vague question, but I would have guessed that you'd see something a little different just from cutting the sample in half.